With a name meaning strength and vigor, both the city and Province of Valencia in Spain live up to their meaning. Valencia Province hugs the coast of eastern Spain on the Mediterranean Sea and is home to orange groves, sandy beaches, and a thousand-year-old Water Tribunal. Valencia city and province offer travellers some of the best parts of Spain. The city is a wonderful mix of ancient history and 21st-century sparkle. The Tribunal de Las Aquas is an ancient farmers' court proceeding held in front of the Door of the Apostle of the Valencia Cathedral. This court has been settling water disputes of the Turia River and the fields surrounding Valencia City since the 10th century. Eight farmers, elected every two years, rule on irrigation disputes every Thursday at noon. A crowd of curious tourists usually looks on. Even without the ancient proceedings, the Valencia Cathedral is still worth a visit. Built over many centuries, it is a showcase of Gothic, Romanesque and Baroque architecture. Valencia city is the third largest in Spain, with a population of about 800,000 people. It hosted the 32nd America's Cup sailing regatta in 2007. It is a port city, and pleasure boats of all sizes take advantage of the 300 days a year of sunshine all along the province's coast. Beautiful weather and millennium-old Water Court are not the only reasons to visit Valencia. The City of Arts and Science merits at least a full day's tour. 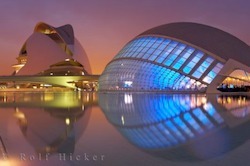 This futuristic complex marries, as the name suggests, culture and science for a spectacular result. The art palace houses an opera house and two smaller theaters. The science museum is a giant hands-on classroom, while the L'Oceanografic brings all the world's oceans together in Europe's largest marine park. Dolphin shows and an underwater tunnel will surely be the highlight of any trip. But before you go, come face to face with the Hemisferic Planetarium. On a still day, the building appears as an eerie giant floating eyeball - complete with blinking effects. A bus tour of Valencia City will bring you to all the major attractions, for as little as 12 Euro. You can hop on and off the open-topped busses to explore the City of Arts and Science and other sites on your own time. Don't forget to leave time to discover the colourful street markets where fresh fruit and vegetables from nearby farms sell for cheap directly from the farmers. You can usually pick up a bargain or two on crafts or souvenirs as well. Naturally the markets will sell oranges. 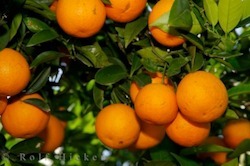 The sweet, juicy variety we know as Valencia oranges. These fruit came originally from South Asia, and now thrive in the Mediterranean climate. The town of Olivia is in the heart of the orange-growing region that has been producing the aromatic citrus since the 1500s. Not only are the fruit exported worldwide, but the fallen orange blossoms are dried for tea. Olivia itself is a charming town of narrow streets and castle ruins, and an increasing tourist trade. Situated on the Costa Blanca just south of Valencia City, the golf course and beach here are popular with Spaniards and foreign tourists alike. Kitesurfing is another popular pastime, taking advantage of the coastal breeze in this area. The bright Gazania wildflowers that grow around town are coloured with the same pen as the citrus fruit in hues of yellow, orange and red. 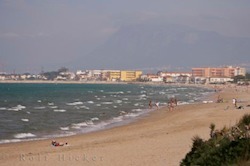 A short drive South lies the town of Denia. Denia is an important harbour not only for the hundreds of yachts that tie up here, but also for the local economy. Fishing is a mainstay for locals, with tourism a close second. It's here where many travelers catch the ferry to Palma de Mallorca and Ibiza, though there is also service from Valencia city. For landlubbers, there are miles of sandy beaches and rocky coves to explore. South again, visitors will come across Montgo National Park near Javea. Here, the Cap de San Antoni Lighthouse stands watch over the Alicante Coast of southern Valencia. In the 1600s the cape was a key lookout for pirates, but visitors today only need worry about the view. Away from the salt air, Valencia province has many small towns and parks to discover. 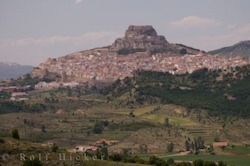 Don't miss the Castle in the Sky at Morella, a walled town North-West of Valencia City. Though the town is inland, it is built on a hill 1 kilometer in the air, affording it a view of the surrounding valleys you left behind at sea level. Shop the tiny storefronts for local preserves, produce, and cheese. Get lost in the maze of narrow streets that wind between five-story buildings. Get found again in the museums dedicated to each period of the history of the town. The fortress on the hill has seen more than its fair share of battles and changed hands many times. Valencia is at once a spectacular destination for two and a family retreat. There's a lot to take in here - don't forget to pack your sunscreen.